A few weeks ago all of our employees embarked on an adventuresome afternoon corporate retreat. We went bowling. We started off with a meeting to talk a little about our company culture. We have certain agreements we all commit to that revolve around character, integrity, attitude, customer care, excellence in all we do, having fun and caring for each other. Our corporate mission is simply to earn customer loyalty. My philosophy is that if we earn your loyalty in all we do while we care for each other at work and have a little fun along the way, all that truly matters will fall into place. The points-based, team-swapping bowling ended in a sudden death three-way bowl-off between two of the best bowlers and one of the, shall I say, least productive bowlers. But that is exactly who rose to the occasion and took home the much coveted title. 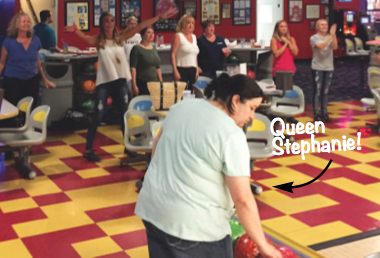 If you happen to connect with our ad traffic coordinator, Stephanie Eckman, you’ll know it was character, not luck, that rolled her to bowling queen stardom.